In the face of drought and desertification, well-designed water harvesting earthworks such as swales, ponds, and dams are the most effective way to channel water into productive use. The result can be increased food production, higher groundwater levels, reduced irrigation needs, and enhanced ecosystem resilience. Yet due to a lack of knowledge, designers, and landowners often build earthworks that are costly, inappropriately sized and sited, or even dangerous. 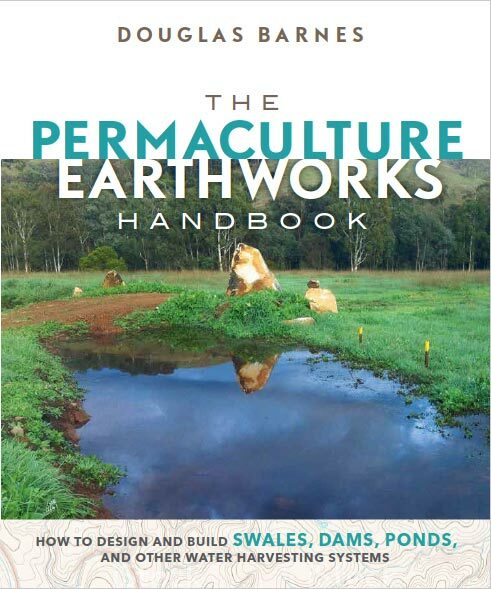 The Permaculture Earthworks Handbook is the first dedicated, detailed guide to the proper design and construction of water harvesting earthworks. It covers the function, design, and construction methods for nine main types of water harvesting earthworks across a full range of climates. This practical handbook is the essential resource for permaculture designers, teachers and students, landowners, farmers, homesteaders, landscape architects, and others involved in maximizing the water harvesting potential of any landscape at the lowest cost and impact. Cover photo by David Spicer. "Water is the key element wherever we choose to live. Having travelled widely with indigenous people in both wet and dry climates I know how much care we need to spend on getting water if we are to break with the unsustainable option of plumbing into the grid. Douglas Barnes has written the key book on harvesting water for permaculture living. Clear, lively and extremely well written- it's destined to be a classic." "Required reading for students of permaculture design, regenerative agriculture, and earth restoration." "This needs to be a standard reference on the desk of every landscape designer, forester, agronomist, and master planner." "After reading this book, you’ll be ready to move some serious dirt." "Creating earthworks to manage water resources is the crucial first step in permaculture land development and Douglas Barnes provides an essential guide doing it right the first time." "In The Permaculture Earthworks Handbook, Douglas Barnes has taken a complex subject and presented it in easy to understand language that anyone can follow…. A must read for anyone undertaking an earthworks project. " "This remarkably thorough and comprehensive book will be of great value to all who are seriously interested in shaping the ground to get the maximum value from the water that is available to them, while also taking excellent care of their land." Douglas Barnes is a permaculture designer and trainer who specializes in rainwaterharvesting earthworks. Trained in Australia by Bill Mollison and Geoff and Danial Lawton, he has designed and built permaculture projects in North America, Japan, and Andra Pradesh, India. Douglas has an interest in complexity theory and systems ecology, educational design and rock climbing. He lives in Tweed, Ontario in a passive solar house he designed and built, and he blogs at www.PermacultureRerelections.com.